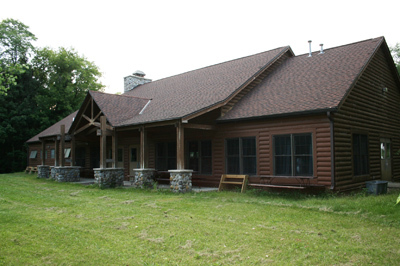 Camp Oh-Da-Ko-Ta features several options for units and non-Scouting groups to rent for ceremonies, parties, and other activities! CLICK HERE to reserve a program area today! The dining hall seats up to 200 people. The kitchen can be rented separately. A certified food manager must be present when renting the kitchen, or at least one person from the group must be trained by a campmaster. Public restrooms and shower facilities are attached to the west end of the dining hall and are shared with all units in camp. The fire bowl is the perfect place to hold a large campfire program, crossover ceremony or other large-format presentation! The fire bowl is located south of the dining hall, just north of Dyer Lake.